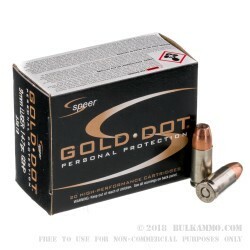 Speer Gold Dot has been a contender since day one of its inception into the personal defense marketplace. 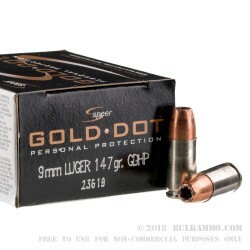 The bullet engineering has had a very good run in the self-defense scene allowing Speer to build a whole new ecosystem around the popular line in the modern years at CCI. This is a 9mm, 147 grain jacketed hollow point with a unique projectile that has tested well in historical gelatin tests. 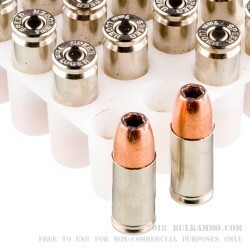 The 147 grain jacketed hollow point is a staple in the self defense world with the already excellent penetration of the 9mm and the heavier projectile imparting its benefits on target, this round has found a good compromise between stopping power and recoil management. The 950 fps velocity offers good velocity, enough to push the round into soft tissue deep enough for requisite penetration and enough to cycle the actions of a variety of firearms. The 325 ft. lbs. of energy created is lower than other hotter rounds but still offers sufficient stopping power without any real drawbacks. The brass casing and boxer primer makes for easy reloading for those so inclined. The clean burning powders and bonded jacket make the fouling and clean up minimal between shooting sessions.